I'm very proud of the far that I grew up in Cork's Muskerry Gaeltacht, or Gaeltacht Mhúscraí. This meant that I completed all my education through to secondary level "as Gaelige". I sat my Leaving Certificate in Irish, even going so far as to have Irish language textbooks for subjects such as Mathematics and Applied Mathematics. It all seems so distant now in this modern world where I travel the world and work with many cultures, but it has had a deep influence on my life. But being from the Gaeltacht is about much more than just speaking our native language. What I took for granted as a child and teenager has been revealed by adult life to be a cultural treasure-trove. These days, there is a new form of culture developing at home in Cork. Well-established food companies such as Coolea Cheese, Folláin Jams and Preserves and Macroom Oatmeal (located just a tad outside the Gaeltacht) have been joined by newcomers including McCarthy's Natural Dairy, 9 White Deer (beautifully named after the legends of Naomh Gobnait), the hirsute Mountain Man Brewing and Toonsbridge Dairy. I'd love to know what they're putting in the water down there! Out of all these great companies, I have a certain grá for Folláin Jams. As a child, I would head into the fields with my mother or cousins to pick blackberries or other summer fruits for their jams. I can't remember what we got paid per pound, but I probably ate my way through a lot of potential earnings. Whenever I hear the word "halcyon", these are the memories that are conjured. Sunshine, scratches on my arms from briars and fingertips stained with blackberry juice. Back at the farmhouse, I would slather slices of my grandmother's brown and white soda breads with thick layers of butter and jam. 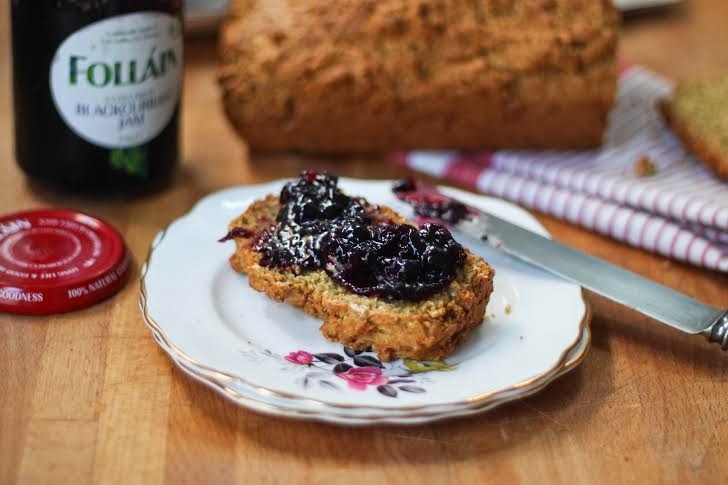 If you want to try a little taste of Ireland on St Patrick's Day, or indeed any time of year, read on for Folláin Jams' "No need to knead brown bread"
Serve with a piping hot cup of tea! If you need a little extra assistance, a video of this quick and easy recipe is available here.